Discussion in 'Turkey Hunting' started by w/chunter, Mar 31, 2019. Had a great morning hunting at the NWTF Wheelin' Sportsman Hunt in Greene Co on Sat. Patrick Paysinger and the Volunteer Longbeard Chapter are an outstanding group of Sportsman. My guide, Joseph Justice, along with the land owner's son, Brandon Roberts and I got in the blind before 6:00am. As day began breaking, birds started gobbling all around us. We knew our best bet would come from the ridge in front of us, as we had a creek and fence in some thick stuff directly behind the blind. About 7:15 a hen came out into the field and began feeding in the field around the 2 hens and jake decoys we had out. Occasionally we would hear a distant gobble and drumming. 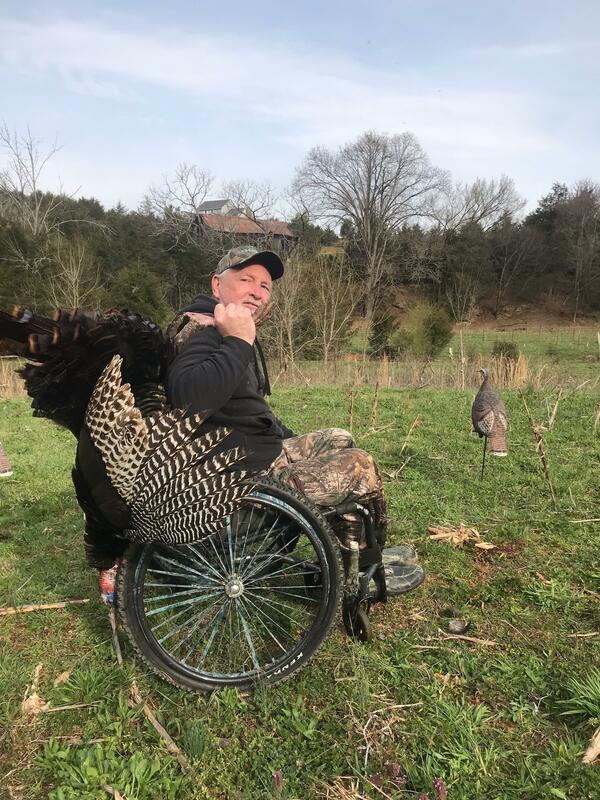 Finally around 8:00 Joseph was able to call a lone Tom off of the ridge, but he got hung up at the edge of the field, around 70 yards and for the next hour, he would strut, posture, dust, everything except gobble or move out of a 5-10 yard circle. Finally, he started slowly walking and picking across the field in front of us, staying 60 yards out, but always watching the live hen who continued to pick in the field the entire morning. It was only when the hen dropped off a rise in front of us, that the tom decided to walk closer, trying to keep her in his sight. After nearly 1 1/2 hours, he presented me with a 23 yard shot and the Mossberg 835 topped with a Bushnell Trophy TRS-25 Red Dot Sight and loaded with 3in #5 Longbeards put him down hard. tbrothers, barney, Munson and 15 others like this. Awesome Friend! Way to hang tough! In your hunt and in life. Way to go. That’s great. Congratulations. Congrats on a great bird. It sounds like you had an awesome day in the woods. Congrats on a great hunt !! Thanks for sharing. Congrats on a great bird! Way to hang in there! Atta boy !!! Great job man !!! Great read !!! !